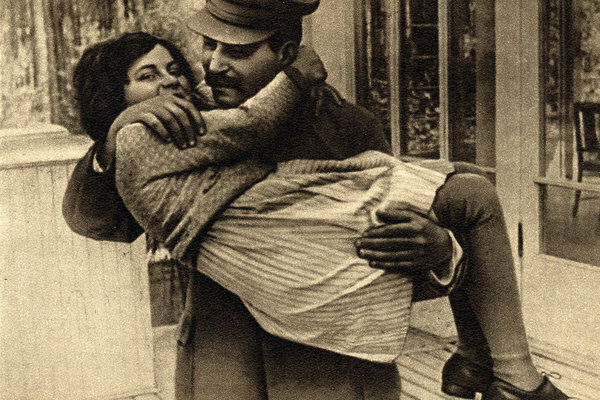 Born Svetlana Stalina, Stalin's daughter changed her name twice and lived in several countries after her famous defection. 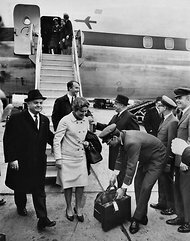 Ms. Peters, then known as Svetlana Alliluyeva, arrived in the United States in April 1967. Ms. Peters made her home in the Northeast, where she gave several interviews. She married and changed her name in 1970. 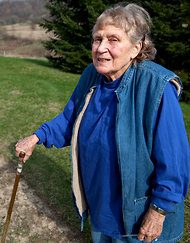 Ms. Peters was photographed last year in Wisconsin. From left, Stalin, accompanied by Prime Minister Vyacheslav Molotov, Nikolai Shvernik, and young Svetlana in 1937. Her death, like the last years of her life, occurred away from public view. There were hints of it online and in Richland Center, the Wisconsin town in which she lived, though a local funeral home said to be handling the burial would not confirm the death. A county official in Wisconsin thought she might have died several months ago. Phone calls seeking information from a surviving daughter, Olga Peters, who now goes by the name Chrese Evans, were rebuffed, as were efforts to speak to her in person in Portland, Ore., where she lives and works. Ms. Peters’s initial prominence came only from being Stalin’s daughter, a distinction that fed public curiosity about her life across three continents and many decades. She said she hated her past and felt like a slave to extraordinary circumstances. Yet she drew on that past, and the infamous Stalin name, in writing two best-selling autobiographies. Long after fleeing her homeland, she seemed to be still searching for something — sampling religions, from Hinduism to Christian Science, falling in love and constantly moving. Her defection took her from India, through Europe, to the United States. After moving back to Moscow in 1984, and from there to Soviet Georgia, friends told of her going again to America, then to England, then to France, then back to America, then to England again, and on and on. All the while she faded from the public eye. Ms. Peters was said to have lived in a cabin with no electricity in northern Wisconsin; another time, in a Roman Catholic convent in Switzerland. In 1992, she was reported to be living in a shabby part of West London in a home for elderly people with emotional problems. Her life was worthy of a Russian novel. It began with a loving relationship with Stalin, who had taken the name, meaning “man of steel,” as a young man. (He was born Ioseb Besarionis dze Jughashvili.) Millions died under his brutally repressive rule, but at home he called his daughter “little sparrow,” cuddled and kissed her, showered her with presents, and entertained her with American movies. She became a celebrity in her country, compared to Shirley Temple in the United States. Thousands of babies were named Svetlana. So was a perfume. At 18, she was setting the table in a Kremlin dining room when Churchill happened upon her. They had a spirited conversation. But all was not perfect even then. The darkest moment of her childhood came when her mother, Nadezhda Alliluyeva, Stalin’s second wife, committed suicide in 1932. Svetlana, who was 6, was told that her mother had died of appendicitis. She did not learn the truth for a decade. In her teenage years, her father was consumed by the war with Germany and grew distant and sometimes abusive. One of her brothers, Yakov, was captured by the Nazis, who offered to exchange him for a German general. Stalin refused, and Yakov was killed. In her memoirs she told of how Stalin had sent her first love, a Jewish filmmaker, to Siberia for 10 years. She wanted to study literature at Moscow University, but Stalin demanded that she study history. She did. After graduation, again following her father’s wishes, she became a teacher, teaching Soviet literature and the English language. She then worked as a literary translator. A year after her father broke up her first romance, she told him she wanted to marry another Jewish man, Grigory Morozov, a fellow student. Stalin slapped her and refused to meet him. This time, however, she had her way. She married Mr. Morozov in 1945. They had one child, Iosif, before divorcing in 1947. Her second marriage, in 1949, was more to Stalin’s liking. The groom, Yuri Zhdanov, was the son of Stalin’s right-hand man, Andrei Zhdanov. The couple had a daughter, Yekaterina, the next year. But they, too, divorced soon afterward. Her world grew darker in her father’s last years. Nikita S. Khrushchev, Stalin’s successor as Soviet leader, wrote in his memoirs about the New Year’s party in 1952 when Stalin grabbed Svetlana by the hair and forced her to dance. After Stalin died in 1953, his legacy was challenged, and the new leaders were eager to put his more egregious policies behind them. Svetlana lost many of her privileges. In the 1960s, when she fell in love with Brijesh Singh, an Indian Communist who was visiting Moscow, Soviet officials refused to let her marry him. After he became ill and died, they only reluctantly gave her permission, in early 1967, to take his ashes home to India. Once in India, Ms. Alliluyeva, as she was known now, evaded Soviet agents in the K.G.B. and showed up at the United States Embassy in New Delhi seeking political asylum. 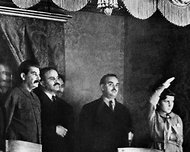 The world watched in amazement as Stalin’s daughter, granted protection, became the most high-profile Soviet exile since the ballet virtuoso Rudolf Nureyev defected in 1961. The United States quickly dispatched a C.I.A. officer to help her travel through Italy to neutral Switzerland, but American officials worried that accepting her into the United States could damage its improving relations with Moscow. Finally, President Lyndon B. Johnson, on humanitarian grounds, agreed to admit her but asked that there be as little fanfare as possible. Unknown to Washington at the time, the K.G.B. was discussing plans to assassinate Ms. Alliluyeva, according to former agency officials who were quoted by The Washington Times in 1992. But, they said, the K.G.B. backed off for fear an assassination would be traced back to it too easily. Settling in Princeton, N.J., Ms. Alliluyeva made a public show of burning her Soviet passport, saying she would never return to the Soviet Union. She denounced her father as “a moral and spiritual monster,” called the Soviet system “profoundly corrupt” and likened the K.G.B. to the Gestapo. In interviews, however, she acknowledged loneliness. She missed her son, Iosif, who was 22 when she left Russia, and her daughter, Yekaterina, who was then 17. But she seemed to find new vibrancy in 1970, when she married William Wesley Peters. Mr. Peters had been chief apprentice to the architect Frank Lloyd Wright and, for a time, the husband of Wright’s adopted daughter. 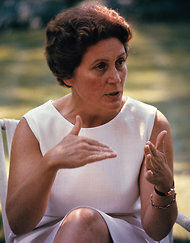 Wright’s widow, Olgivanna Wright, encouraged the Peters-Alliluyeva marriage, even though the adopted daughter was Mrs. Wright’s biological daughter from a previous marriage. That daughter was also named Svetlana, and Mrs. Wright saw mystical meaning in the match. Within two years, they separated. Ms. Peters was granted custody of their 8-month-old daughter, Olga. They divorced in 1973. Information about the next few years is sketchier. Ms. Peters became a United States citizen in 1978 and later told The Trenton Times that she had registered as a Republican and donated $500 to the conservative magazine National Review, saying it was her favorite publication. She and Olga moved to California, living there in several places before uprooting themselves again in 1982, this time for England so that Olga could enroll in an English boarding school. She also began to speak more favorably of her father, Time magazine reported, and perhaps felt she had betrayed him. “My father would have shot me for what I have done,” she said in 1983. At the same time, Stalin was being partly rehabilitated in the Soviet Union, and Soviet officials, after blocking Ms. Peters’s attempts to communicate with her children in Russia, relaxed their grip. Iosif, then 38 and practicing as a physician, began calling regularly. He said he would try to come to England to see her. “For this desperate woman, seeing Iosif appeared to herald a new beginning,” Time said. Ms. Peters and Olga were given Soviet citizenship, but soon their lives worsened. The son and daughter who lived in Russia began shunning her and Olga. Defying the official atheism of the state, Olga insisted on wearing a crucifix. They moved to Tbilisi, Georgia, but it was no better than Moscow. In April 1986, they returned to the United States, with no opposition by the Soviet authorities. Settling at first in Wisconsin, Ms. Peters disavowed the anti-Western things she had said upon her arrival in Moscow, saying she had been mistranslated, particularly the statement about being a pet of the C.I.A. Olga returned to school in England. Ms. Peters said she was now impoverished. She had given much of her book profits to charity, she said, and was saddled with debt and failed investments. An odd, formless odyssey began. Friends said she appeared unable to live anywhere for more than two years. Mr. Peters died in 1991. Ms. Peters’s son, Iosif, died in November 2008. Besides her daughter Olga, now Ms. Evans, Ms. Peters is survived by her daughter Yekaterina Zhdanov, a scientist who goes by Katya and is living on the Kamchatka Peninsula in Eastern Siberia studying a volcano, according to The Associated Press. Reached later on Monday by e-mail, Ms. Evans told The A.P. that her mother had died in a nursing home in Richland Center, where she had lived for three years. “Please respect my privacy during this sad time,” the wire agency quoted her as saying. Ms. Peters was said to enjoy sewing and reading, mainly nonfiction, choosing not to own a television set. In an interview with The Wisconsin State Journal in 2010, she was asked if her father had loved her. She thought he did, she said, because she had red hair and freckles, like his mother. Elizabeth A. Harris and Lee van der Voo contributed reporting. An earlier version of this article misstated the last name of Ms. Peters’s late son, Iosif. It is Alliluyev, not Morozov. Copyright 2011 The New York Times Company. Reprinted from The New York Times, International, of Tuesday, November 29, 2011.